Cuban-born photographer Abelardo Morell has long been interested in photographic processes, in particular that of the camera obscura. For the past 20 years, he has transformed rooms into visual theatres on to whose walls the external world is projected. On the surface, however, are the everyday furnishings of these rooms: tables, chairs, beds, carpets, plants, shelves, books and other decorative objects. When his city, New York, and its parks, bridges, and the architecture of the most beautiful cities of the world blend into his private space, it becomes almost hallucinogenic. 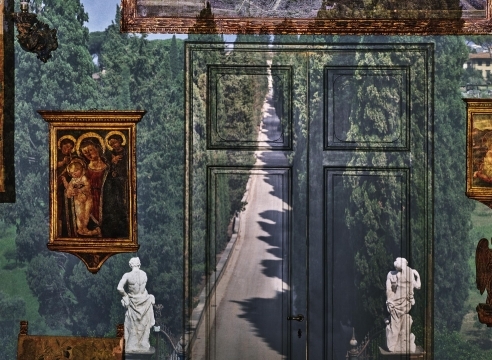 There might be nothing new to the technique, but it’s still easy to let oneself be carried away by the colorful trompe-l’oeil patterns, especially when an open door seems to invite one into another dimension.